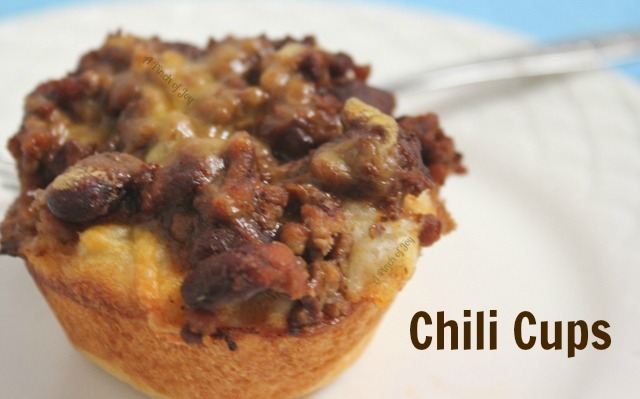 Chili cups. Quick and easy main dish, hearty appetizers or Friday night staple. When Bytes and his brother were grade school sprouts, they got to picnic on a big green beach towel on the living room floor every Friday night and watch their favorite tv show. Forget Family Night. It was Exhausted Mommy and Daddy Night! They had an early bedtime the rest of the week and we were those mean parents that restricted tv watching. Watching that show meant they could keep up with their friends. Reliving and reenacting the show, through the “get into your pajamas and bed routine”, allowed the parents to interject some critical thinking into the process. “Do you think that was the best way to handle that?” kind of question. Well, maybe Mom, if she wasn’t busy corralling flying shoes and hunting pajama bottoms. Dad would come up with bigger explosions, faster cars and devious plot turns. Who am I kidding? It was chaos, but they were happy campers! 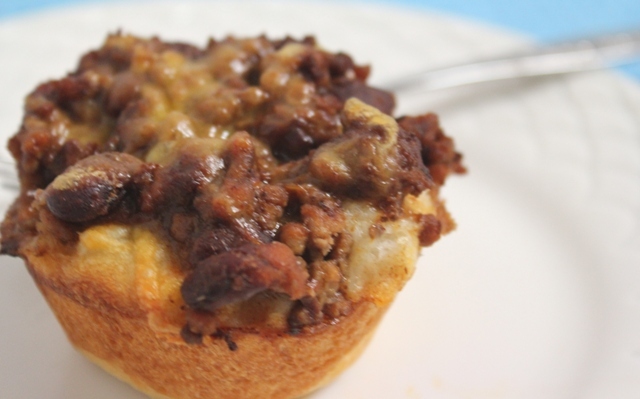 Chili cups were a Friday night invention. It may have been a modification of a Pillsbury biscuit recipe that I’ve seen since and didn’t remember seeing before. Or maybe the inventor of that recipe ripped it off the Vance family via mind meld. In that case, they have greater problems than who thought up the recipe. With all those bits and pieces of ideas on how to save the world, keep the cherry tree alive, keep the bike upright without training wheels, stretch income with coupons, or increase productivity of an engine by adding water to the gas line, the mind melder is still reeling from that encounter! At any rate – take a can of those aforementioned biscuits or your other favorite brand. Look for the flaky, layered version. That way you can separate the layers, stretching your exhausted budget at the same time you reduce the bread part of the recipe. Spray or grease a muffin pan very thoroughly – exhausted people don’t have time to scour stuck on stuff. Separate the biscuits at least in half, maybe thirds, depending on the thickness of the original biscuit. Pat the thin version into the separate muffin cups. Dads can do this really well. Moms can take a pound (give or take) of already browned ground beef (here) from the freezer and thaw it in the microwave. Open a can of chili and pour it into the pan with the thawed meat, stir thoroughly. Anxious kids or exhausted Dad can spoon the mixture into the waiting biscuit cups. Top with shredded cheddar cheese. (If the kids do that step, give them separate containers so you don’t have to clean up the mess from too many hands trying to get in the cheese package at the same time.) Pop the pan into the oven at the temperature on the biscuit package. Check when the biscuit package says its time to be done. If the dough looks pale, bake it until it looks golden but not dark brown. Yield: 16 generously filled to 24 adequately filled chili cups. Serve with a package of carrots (dumped on a plate, we’re not barbarians here. Okay it is Friday night and we’re exhausted — just zip open the package). Gather up a couple handsful each of tiny tomatoes, berries, apple quarters and whatever else is healthy and handy. Add a glass of milk and maybe forks. The kids will take care of spreading the beach towel on the floor without being reminded. Set out the repast on the coffee table or, if you are adventurous, put a tray on the floor between them. Sink into your favorite chair with your own plateful. Following the whole story on tv is optional – all that is important to the kids is that the family is together and it is “their” show / movie. Rejuvenate! Quick and easy main dish or hearty appetizer. Family approved! Brown ground beef, or thaw, if previously browned and frozen. While meat is cooking or thawing, spray muffin pan (one 16 cup or 2 eight cup pans) generously with cooking spray. Separate biscuits into halves and pat each half into the bottom of a muffin cup. Add chili to ground beef and stir thoroughly. Spoon mixture into biscuit lined muffin cups. Bake according to directions for biscuits on package until golden brown. Remove from pan and serve hot! These look great and so easy to make. Visiting from Stuff and Nonsense. Thanks for sharing. I am following you now! These look so good I’m wishing I had one myself now! What a great idea and perfect for a crowd! So glad you shared your creative inspiration with Sunday’s Best – your creativity helped make the party a success! These are awesome Chili Cups, a great idea for a crowd. I will love having this recipe. Hope you have a great week end and thank you so much for sharing with Full Plate Thursday.